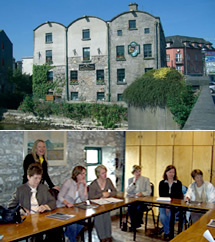 The French Institute is Galway's very own French Language school, located in the Bridge Mills, an 18th century mill situated on the River Corrib in the centre of Galway. All our teachers are qualified native speakers and have extensive teaching experience. Our aim at the French Institute is to allow students of all ages to learn the language in a relaxed and supportive environment. Our students enjoy the benefits of a warm welcome, a pleasant environment, and small-size classes.